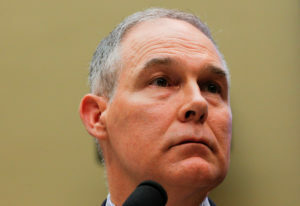 WASHINGTON — Dealing with a slate of toxic chemicals contaminating some drinking water systems around the country is a national priority, Environmental Protection Agency chief Scott Pruitt said Tuesday. Pruitt, who drew scrutiny from lawmakers after EPA emails released this month showed that the agency had intervened in the publication of a new government study on the contaminants, convened what he called a national summit on the chemicals. The chemicals are as perfluoroalkyl and polyfluoroalkyl. Used in some nonstick coatings, in firefighting foam and elsewhere, the chemicals can cause developmental defects and other health problems. Authorities say the contaminants are present in dangerous levels in some water systems, including several near military bases and industries. The emails also revealed EPA officials intervening in the release of the study, which remains unpublished. Politico first reported on the emails. Pruitt, formerly the Republican attorney general of Oklahoma, invited what the EPA said were 200 people to Tuesday’s Washington session on the chemicals. The people attending represented states, tribes, the chemical industry and other sectors, along with some environmental representatives. “It’s clear this issue is a national priority,” Pruitt said, opening the session. He pledged to start work toward establishing a legal maximum limit for the contaminants in drinking water systems. The EPA barred some news organizations, including The Associated Press, from Tuesday’s meeting. EPA spokesman Jahan Wilcox said the session was invitation-only and there was no room for the AP, but did not say what criteria were used in determining which media the agency invited.